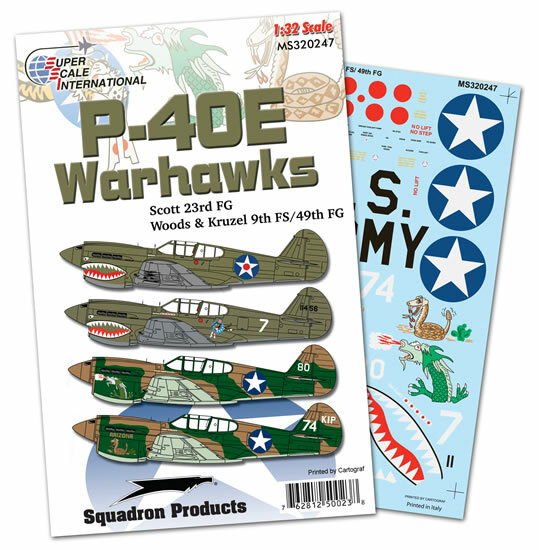 Decals for (3) USAAF P-40E Warhawks: s/n 41-5696?/41-1456? shark mouth 'Old Exterminator', Col Robert Scott, as the 'one-man air force' in India and later as CO of the 23rd FG in China, OD over neutral gray, 1942; 9th FS, 49th FG 'Dragon Flight', Capt Joseph Kruzel, dark green and dark earth over sky gray, Australia, 1942 and 9th FS, 49th FG 'Arizona', Capt Sidney Woods, dark green and dark earth over sky gray, Australia, 1943. 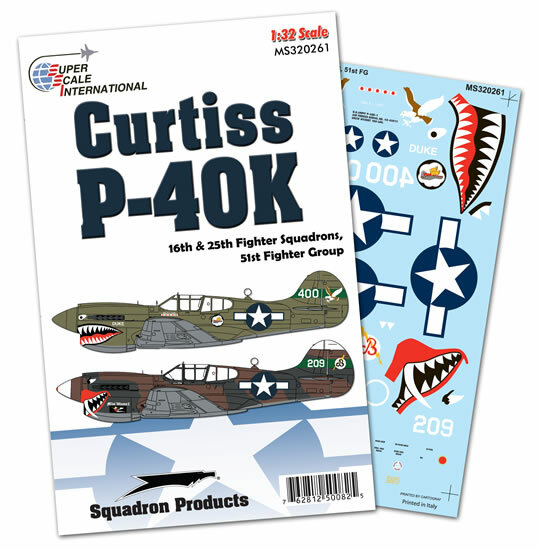 Includes stencils for airframe and bomb, placement guide and color painting reference. Recommended for Hasegawa kit. 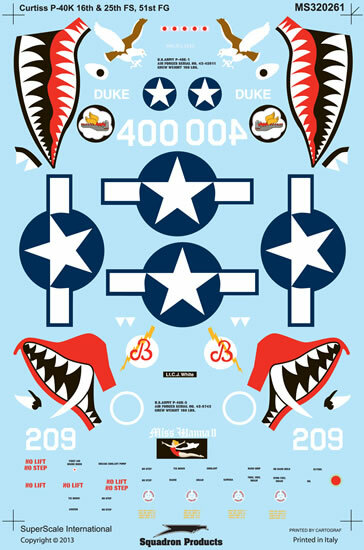 Decals for (2) Warhawks: P-40K-5 'Duke' of the 16th FS, 51st FG, pilot Maj Robert Liles, October 1943 and P-40K-5 'Miss Wanna II' of the 25th FS, 51st FG, pilot 1st Lt Charles White, summer 1943. 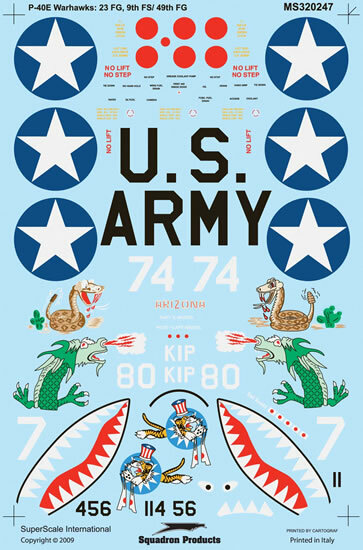 Includes national insignia, nose art, shark mouth, stencil data with detailed placement guide, color profiles and general painting notes (including 3-view art for asymmetric camouflage). 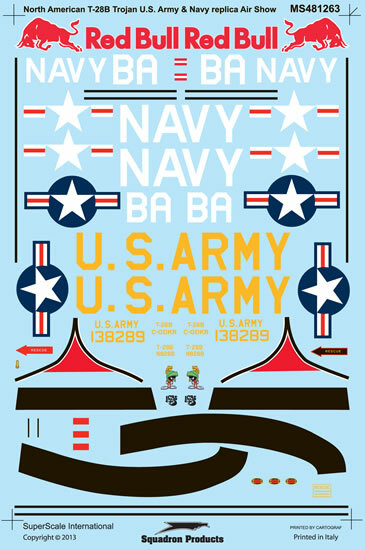 Recommended for Hasegawa kits. 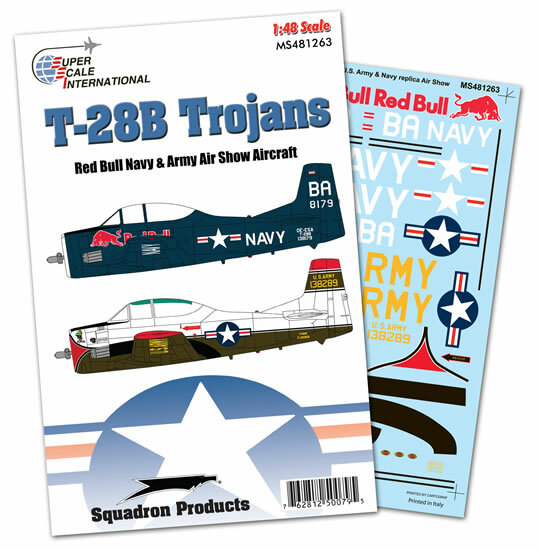 Decals for (2) North American Trojans: BuNo 138179 'Red Bull', Austrian registration OE-ESA in overall gloss sea blue and BuNo 138289 in US Army white over OD scheme (markings for both US and later Canadian registration). 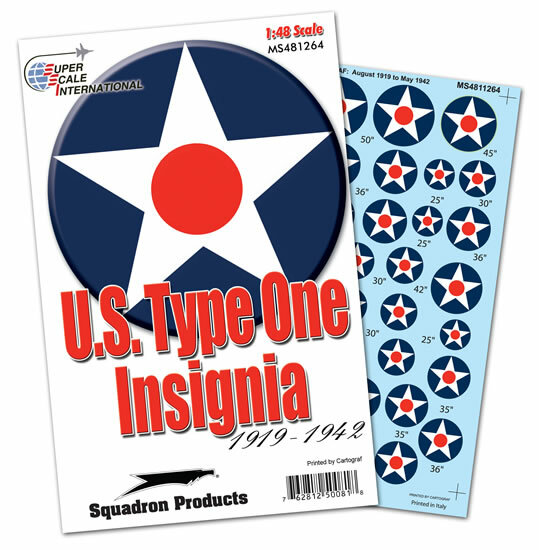 Includes national insignia, nose art, color profiles, plan views and general painting notes. Recommended for Roden kits. 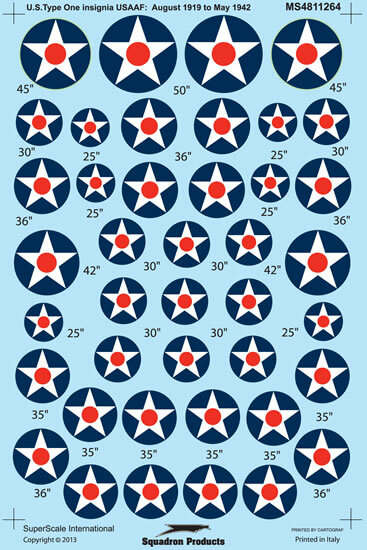 Decals representing US Army aircraft national insignia (stars with red centers) in scale diameters 25", 30", 35", 36", 42" and 50". Includes placement reference for typical inter-war and early WWII aircraft types.